Open Year Round By Appointment! Complete protection and thoroughly secure. 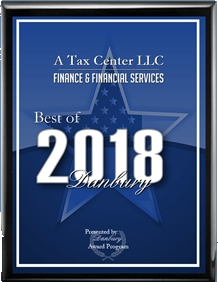 We are a Tax Preparation Service in the Danbury, CT area. We would be happy to help you prepare your tax return. Please feel free to check out our website and contact us if you any questions. We help our clients not only with their returns, but also with any government tax correspondence that comes during the year. Several of our clients became clients after contacting us for help with letters they did not understand from state tax authorities or the IRS. We will meet with clients with new businesses to help them determine the best way to file to file their business tax return and how to set up their records. If your business is an LLC, there is no LLC tax return, but you will have several choices how to file. Amy and Rochelle have been preparing our tax returns for the last 10+ years. They have always been extremely professional and efficient. When we bought a rental house, they helped us to set up the record keeping needed for tax purposes. Later they helped with tax changes when my husband passed away. Rochelle had been our tax consultant for many years. Over time she has become our good friend as well. We are more than pleased with her preparation of our returns and her excellent advice. When we were in business she also handled those returns as well. We have always been impressed with her ability to stay abreast of all the inevitable changes to the tax rules and regulations over the years. We would like to take this opportunity to thank her from the bottom of our hearts for all the professional care she has provided over the many years we have been lucky to know her. We have over 25 years’ experience preparing Individual returns and schedules, including schedule C for small business owners and schedule E for landlords. We have over 20 years’ experience preparing Partnership returns, including K-1s. We have over 20 years’ experience preparing S-Corp returns, including K-1s, and C-Corp returns. We have over 15 years’ experience preparing the 990N (post-card), 990EZ, and 990. A Tax Center LLC is a home based business. You can come to us (and visit with the cats), or we can go to you if you live in the area. We receive information for distance customers via e-mail, fax, the US Postal Service, and FedEx and send completed returns as the customer requests. Connect with us on LinkedIn. We’re offering services to help alleviate the stress that comes with the burden of taxes. Daily Money Management is a service that helps clients manage their money and pay their daily bills. Clients might be elderly people who are no longer able to write out their checks or adult children who want someone more local keeping a financial eye on their elderly parents. Overwhelmed, busy professionals sometimes seek help to keep up with their home bills because they are distracted by business interests. Some small businesses do not need a full time bookkeeper, but do need part time help. We can help you with bill paying, checkbook balancing, reviewing medical statements, organizing financial documents, and more.